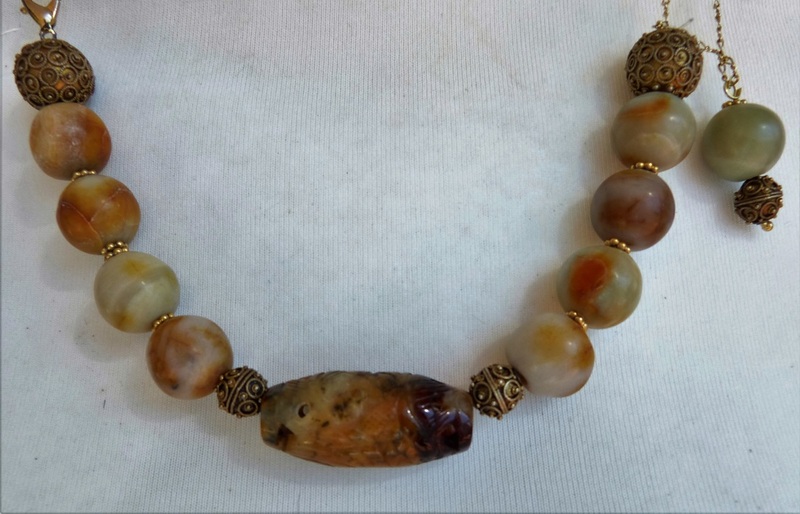 Antique genuine Hetian Jade Beads, carved hollow hard stone pendant, Senegal "gold"
Exceptional one of a kind jewelry set from the Pheul (Fulani) Tribe in Mauretania/North Senegal. This type of jewelry was made in the 1920s and 1930s in North Senegal - St Louis Region, and Mauretania to replace the very much favored solid gold jewelry. The individual beads are wired and all show intricate granulation and trailing work. the focal pendant is 50 mm long, 50 mm wide and 11 m thick including the prongs. The beads set into the prongs are red glass beads , with a few garnets? here and there. the earrings are very intricately worked with coiled and twisted wire, also prongs with beads. working condition! This jewelry is called "or du pays" (gold of the country). Although this is only goldwashed silver and not a silver-gold alloy it is an exceptional one of kind antique piece. Antique bracelet from Senegal from the late 1800s/early 1900s. 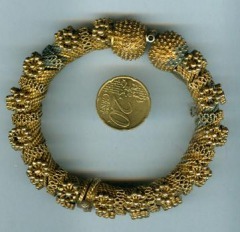 The bracelet is made of low carat gold (10K), a form of gold which is called "or du pays" in Senegal (urussu Ndar). Plain gold cylinders are covered in granulation work and wire decoration. The surface has been pierced in decorative patterns. The design is a very traditional one and seen in beads and almost all gold jewellery from this epoche. In the bracelet "half" cylinders are connected to each other by hinges, the inside is flat. Necklace matching the above bracelet (of these I have two, so there is one for sale. 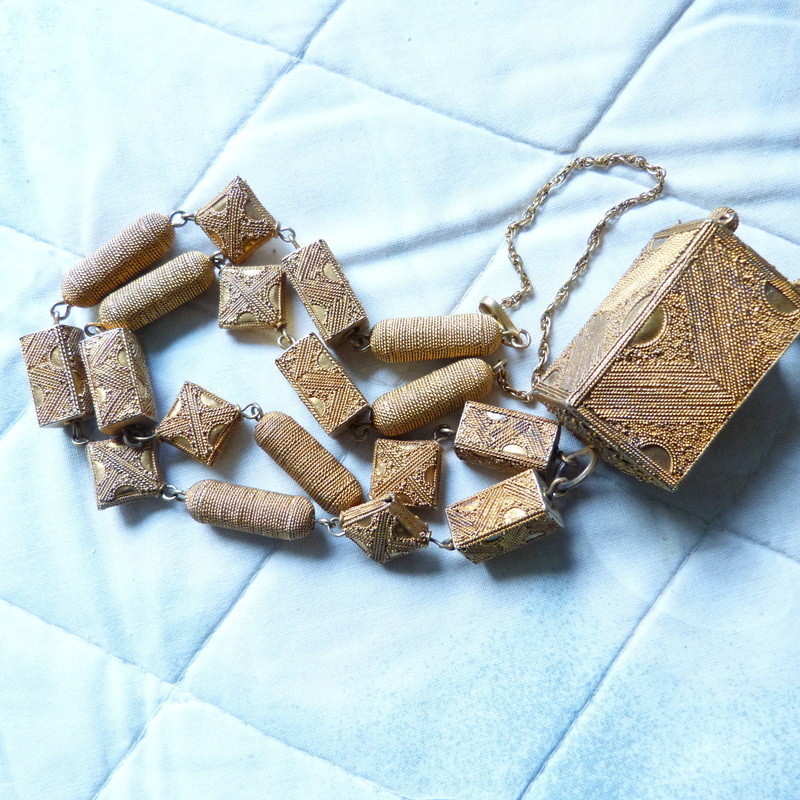 I found this complete necklace in 1996 in an antique shop in Dakar. Up to then I had already aquired a number of loose old beads but never a complete piece of jewellery. The pillow like pendant is 45 x 45 x 15 mm, length of necklace is 80 cm. 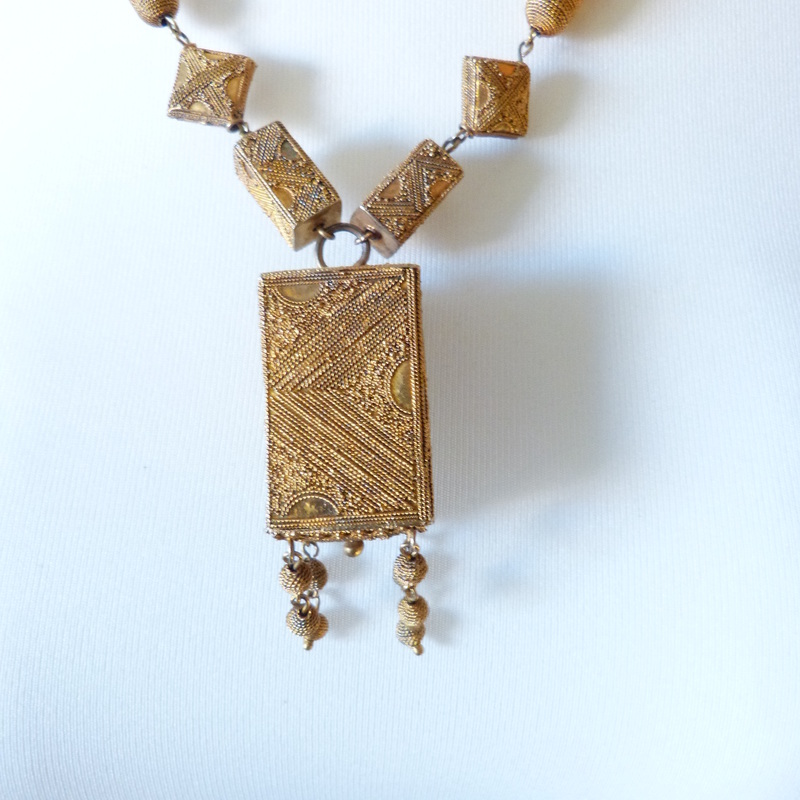 A beautiful example of authentic old Senegalese goldsmith work . 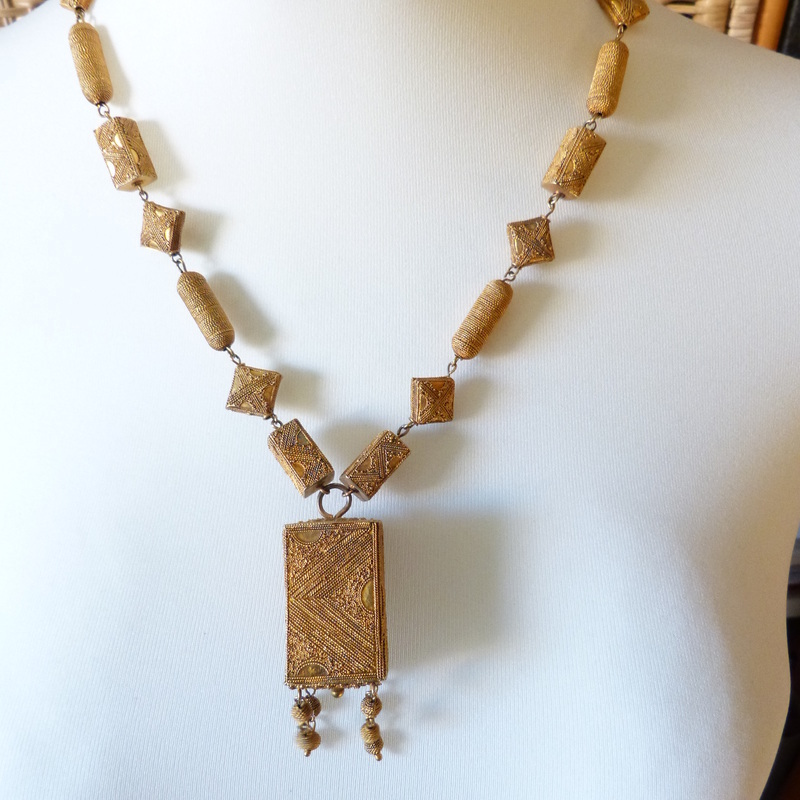 "Or du pays" necklace with a wonderful heart shaped pendant and very unusual gold beads. Also found in Dakar as is in the mid 1990s. However, this is certainly not the original version but assembled later. 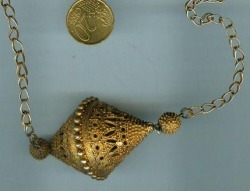 It does not have a clasp and period pieces used to have clasps as seen in the other necklace. 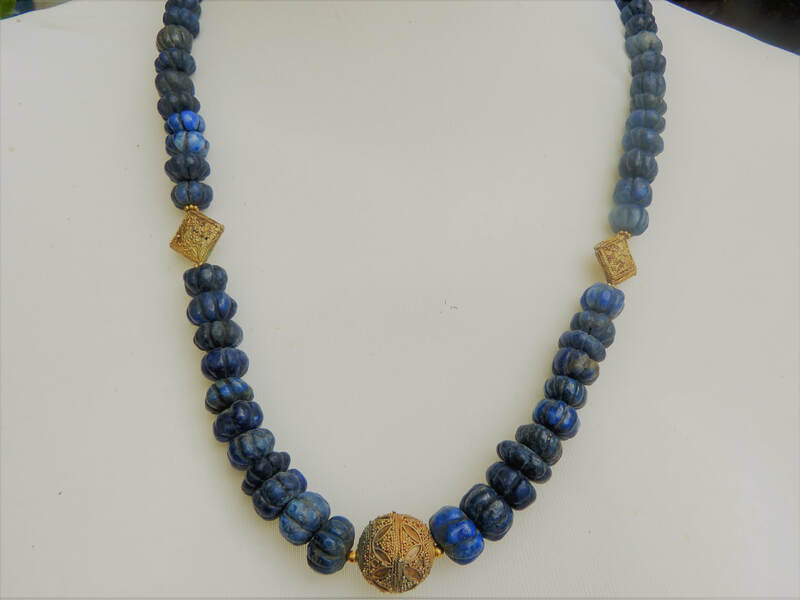 The necklace is simply strung with fishing wire and ordinary glass beads in between the gold beads. These glass beads are Indian made and sold by the pound in Dakar bead shops.. 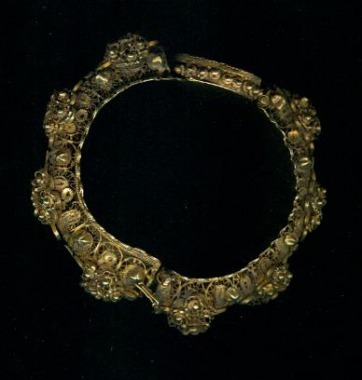 Very old bracelet, estimated to be 19 century. Unfortunately pin and security chain were lost when I lent it for an exposition. Diameter 90 mm, quite heavy 97 grams. tsted for gold on several spots - black spots! 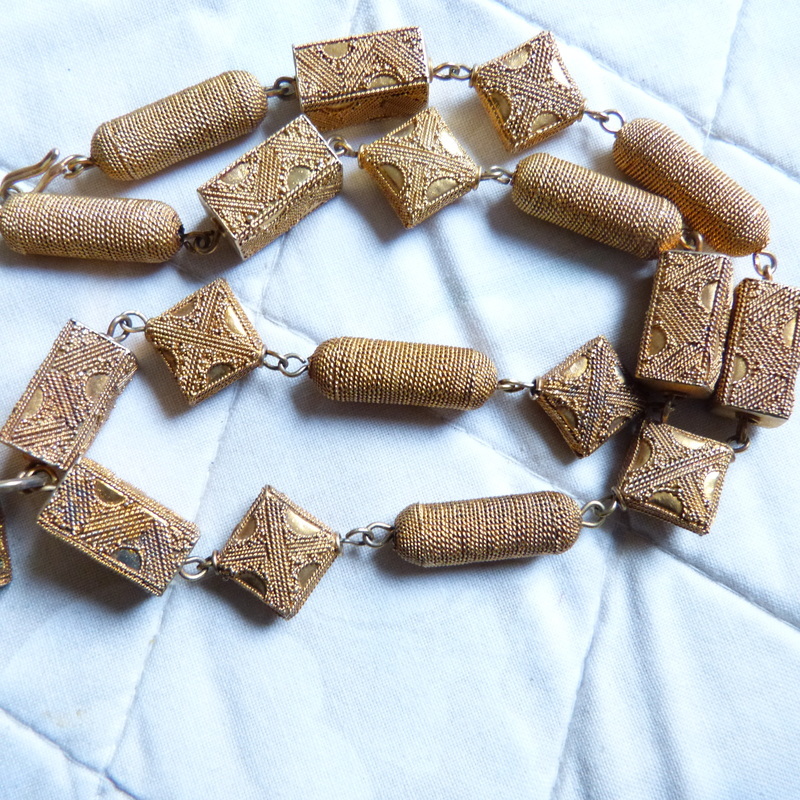 This type of jewelry was made in the 1920s and 1930s in North Senegal - St Louis Region, and Mauretania to replaced the very much favored solid Gold jewelry. The individual beads are wired and all Show intricate Granulation and trailing work. 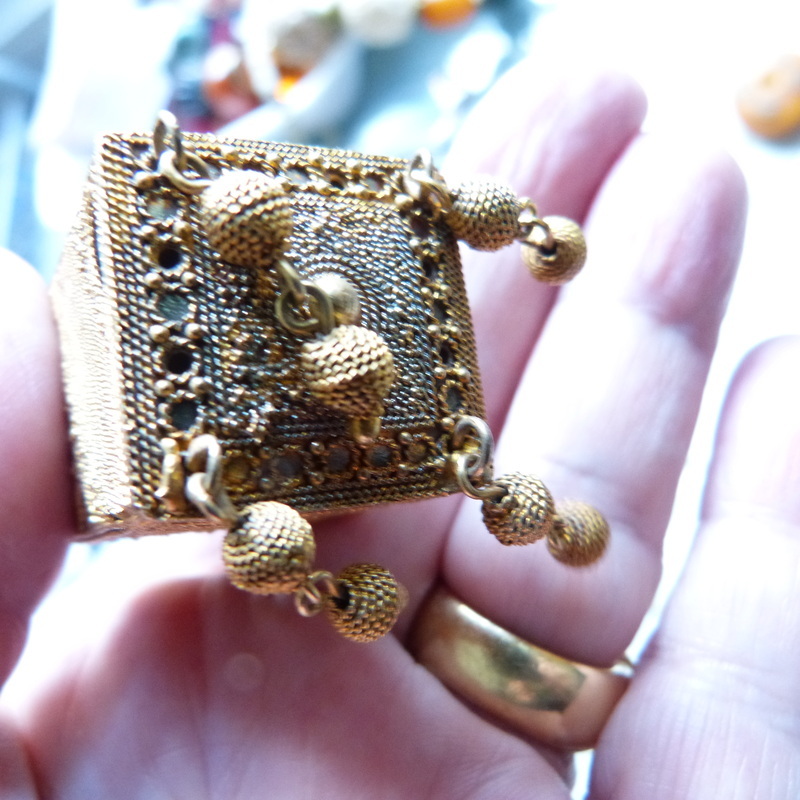 The Collector's dream of old Senegalese Jewellery. Bracelet and matching necklace with flower basket. Both items in pristine condition. Basket size in bracelet 80 x 65 mm, necklace 105 mmx 80 mm, small flowers diameter 30 mm. At the time I was in Dakar there was only one more parure in wearable condition, owned and worn by Marie José Crespin. 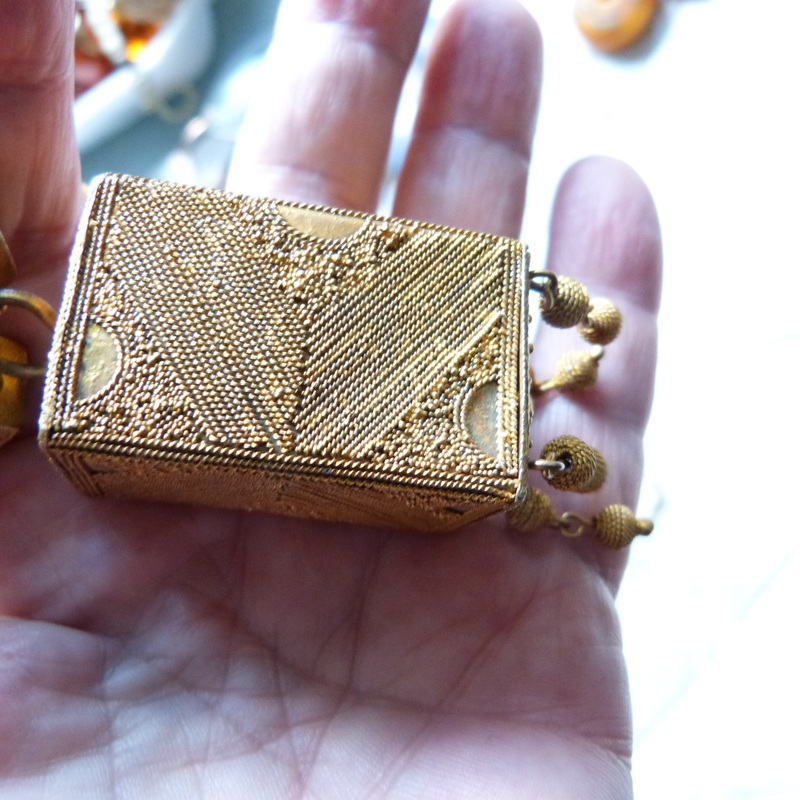 Extraordinary gldsmith filigree work on this bracelet. Dated earlier than the flower basket, end of 19th century. . Complete with pin and security chain, no decoration missing! inner diameter 64 mm, outer diameter 94 mm, 23 mm wide and 93 grams. Bits and pieces of or du pays items. these were found on Tilene Market in Dakar, where they were either resold to collectors or melted to gain the precious metals. You might find them in future creations. Or I can make a special necklace on order!